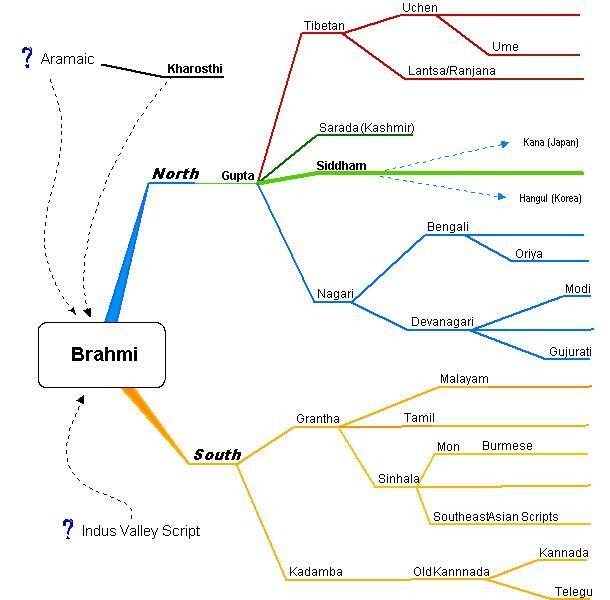 Many attempts have been made to show the relationships between the various Indic scripts, but each is deficient in some way - many for instance The Ancient Scripts Website - leave out Siddhaṃ completely. Tibetan scripts are often glossed over. This page is an attempt to show how the various Indic scripts used by Buddhists to write sacred texts and mantras are related. Links between Aramaic and Kharoṣṭhī, and between Kharoṣṭhī and Brāhmī, and between the Indus Valley script (if it is a script) are conjectured, but while interesting theories abound, none is proved, and with the paucity of evidence none seems proveable at present. There are several websites which catalogue scripts and give details of how they came into being, and where and how long they were in use. - The Ancient Scripts compliments Omniglot and has useful info on relationships and timeframes. - Indian Scripts in Tibet is very detailed. Judicious use of search engines will turn up more of course. There are active projects to include many of these scripts in the unicode specification.